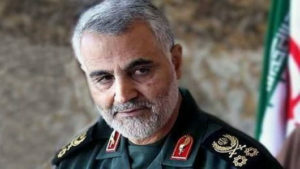 The head of Iran’s Quds force declared on July 26 that the Red Sea “is no longer secure” after Iran-backed Houthi rebels fired missiles at two Saudi oil tankers transiting the sea. Saudi Arabia announced it was temporarily halting all oil shipments through a Red Sea shipping lane after the attack by the Yemen-based rebels. Earlier this month, Iran threatened to block another important oil route, the Strait of Hormuz, after Trump asked U.S. allies not to buy Iranian oil. “Saudi Arabia is temporarily halting all oil shipments through the Bab al-Mandeb Strait immediately until the situation becomes clearer and the maritime transit through Bab al-Mandeb is safe,” he said. The Bab al-Mandeb Strait, where the Red Sea meets the Gulf of Aden, is only 20 kilometers wide, making ships easy targets there. The U.S. Energy Information Administration estimates that 4.8 million barrels per day of crude oil and refined petroleum products were transported through the waterway in 2016 to Europe, the United States, and Asia.